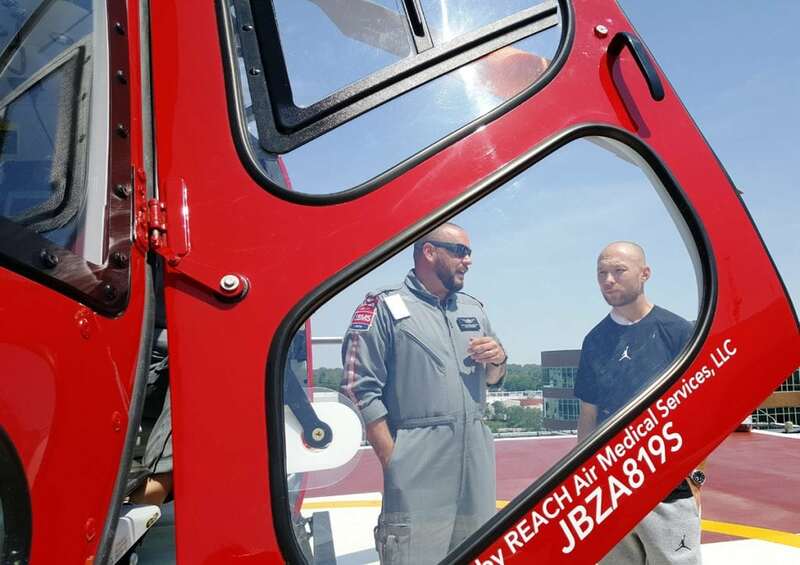 UCHealth LifeLine Flight Paramedic Matthew Bergland talks to Eddie Kerr, an avid dirt bike rider who was flown to Memorial Hospital’s Level I Trauma Center after he became impaled on a tree branch while riding in remote Teller County. “I ended up T-boning a tree pretty good,’’ said Kerr. A tree branch the size of the fat part of a baseball bat glanced off Kerr’s chest protector, punctured into his neck, and into the back of his shoulder, bouncing off his scapula, and leaving Kerr impaled and dangling from the tree. “It was just high enough that I couldn’t really touch the base of the tree, or the ground, so I was just hanging from the tree for a little bit,’’ he said. Kerr knew where he was — 10 miles away from anywhere, where there’s no cell phone service – and how long it would take for help to arrive. Eddie Kerr explains how he became impaled on a tree branch while riding a dirt bike in remote Teller County. Kerr, a truck driver, had about 10 buddies with him that day, and for safety’s sake, they use a “ladder’’ system when they ride. When the lead bikers come to an intersection, they stop and wait for the others. If no one comes, they turn around and go back. One of Kerr’s best friends turned around, and found Kerr on the ground. He raced for help. Then two more friends arrived – one put a glove inside the wound and applied pressure, another held up Kerr’s arm. When Boyce and Divide Fire arrived at the trailhead, Good Samaritans offered up their ATVs to the first responders who then rode for 30 minutes before reaching Eddie, who was still receiving direct pressure to his wound from his friend. “We found him on the trail with probably a dozen bystanders and two deputies from Teller County. … Eddie was not looking the greatest at that point. There was a significant amount of blood around him. He was gray and pretty confused. We got some vital signs. We put some IVs in him and we got a plan together. The bystander was still holding pressure,’’ Boyce said. By that time, UCHealth’s LifeLine helicopter was overhead. 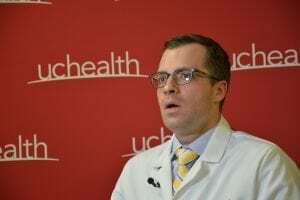 Dr. Greg Day, UCHealth trauma surgeon, operated on Eddie Kerr after he came to Memorial Hospital Central’s Level I Trauma Center. “When we got to Eddie, he was packaged, ready to be transported and Ute Pass Regional Paramedic Services had already treated him. They gave him a clotting agent in his neck, so that he wouldn’t bleed. 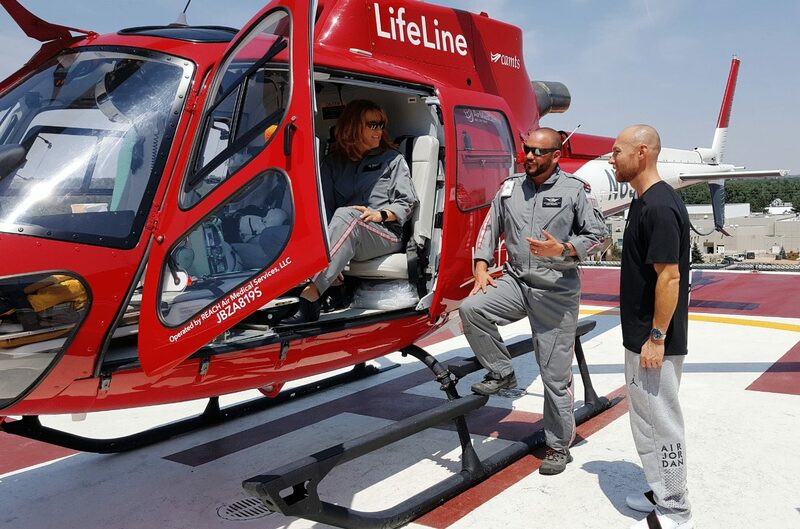 We loaded him onto an ATV and started transporting him to the helicopter,’’ said Matthew Bergland, UCHealth LifeLine flight paramedic. 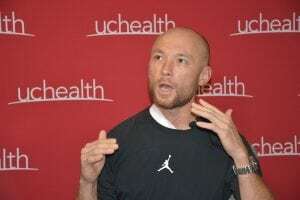 “The injuries were very, very significant and probably without air transport the outcome could have been much different,’’ Bergland said. Kerr’s wife, Tammy Kerr, got a call from a friend that Eddie had been hurt. She didn’t think much of it, because Eddie has broken bones before. Then, when the friend said it was “real bad,’’ Tammy got “a weird, hot tingly feeling.’’ She arrived at the hospital a short time later. Dr. Greg Day, the trauma surgeon who operated on Kerr, said Kerr “carried a lot of the tree with him’’ and needed surgeries to clean the wound of leaves and pieces from the tree. Day said paramedics in Teller County did a superb job. Providing a clotting agent in Kerr’s wound, to keep it from bleeding, was exactly the right thing to do. Kerr said he had two broken ribs, a broken vertebrae, broken scapula and punctured lungs. He spent seven days in the hospital, arriving on Sunday and leaving the following Sunday. UCHealth Flight Nurse Ami Bess sits in the cockpit of a UCHealth LifeLine helicopter. Bess cared for Eddie Kerr as he was flown to Memorial Hospital Central’s Level I Trauma Center in Colorado Springs. Matthew Bergland, a flight paramedic, is also pictured. In the end, Kerr had good fortune. He was wearing the right protective gear, had a friend apply direct pressure to the wound, had an army of paramedics on the ground and in the air fighting for him and a Level I Trauma Center ready to care for him. Kerr said he has retired from dirt bike riding, and he plans to pursue new sports — golf and fishing.